Amazing! Lif Is Burnin' Up the Place! Edans guest production and vocals make this a Primo Release.Not to Mention One of the Hottest Definitive Jux Releases to Boot!This enhanced cd includes two videos 'Because They Made it That Way' and 'Home of the Brave' live at DJXP2 Release Party at SOB's NY 2/28/2002. I know, how could an EP be worth 5 stars? 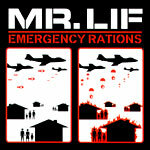 But the truth is, is that this EP is just as potent as Mr. Lif's critically acclaimed "I Phantom". The album also delivers a concept. The premise being that Mr. Lif has been kidnapped by unidentified government agents, and is now missing. Throughout the album's content, we find out that Lif's relentless attacks on civil rights, censorship, and U.S. foreign policy, is the reason that Mr. Lif presents such a threat. Mr. Lif presents his political commentary in such a way, that the listener soaks it up like a sponge. The lyrics are metaphorical, but also direct. Leaving small subtleties to eke their way into your mind. Lif makes it work quite brilliantly, and he never comes off as too preachy. We get production from Mr. Lif, Akrobatik, DJ Hype, DJ Fakts One, Edan (also guest vocalist), and El-P. Like "I Phantom," the lyrics are always on the forefront. Although the lyrics are very politically charged, Lif does drop some humor on us too, with his love for movies and video games. Check out these rhymes from "Jugular Vein" - "Once upon a time I had to slay crews / And the story never ends like a Atreyu's". Check this one out - "Pick up a controller and lets play Tekken 3 / Whoop that a** 4 times, now you wanna switch / You can use Eddie, now I'm Dr. Barsconovich". Throwing in lyrics like that show how much fun Lif can be, while simultaneously delivering mind bending lyrics to feed your mind. The next track is an assault on your ears, and one of my favorites, "Heavy Artillery", where he uses his enthralling lyrics as ammo for warfare. The next track, "Home of the Brave" is probably my favorite at this point. It contains the most insightful lyrics that relate to his message (that's debatable). His vicious attacks on George W. Bush are impossible to ignore - "Bush disguises blood lust as patriotism / Convincing the living to love 'Operation Let's Get 'Em' / But when he realized we don't support their attacks / They needed something to distract, hmmm, ANTHRAX". Unlike production from other Jukies, "Pull Out Your Cut" features some old-school funky beats (also one of my favorites). "The Unorthodox" and "Get Wise '91" also add heavily to the EP. The latter featuring lyrics and production from Edan, who also has a very sweet flow, and changes the album up quite nicely. The last track "Phantom," features guest vocals and some ill beats by El-P, which acts as a teaser for Mr. Lif's forthcoming full release "I Phantom". Overall, I'm quite impressed with "Emergency Rations". The EP is only 30 minutes long, but it's chalk-full of great material, and feels very complete. If you were lucky enough to find the full length version of this EP, which includes the extra 11-minute live performance of "Because They Made It That Way/Home of the Brave" then it's actually about 40 minutes long. Although I couldn't find it myself, I'm still quite happy with my purchase. Mr. Lif serves up the entire package here. Sick production, and mind-bowing lyrical content delivered by a very personal, and charismatic emcee. Along with Immortal Technique, Mr. Lif is by far the most relentless MC to come along since Chuck D and KRS-One. If you are a first-time purchaser of Mr. Lif, I would probably recommend "I Phantom" first, but "Emergency Rations" is definitely a close second.